CAPTAIN SONADOR (AUS) (2006). 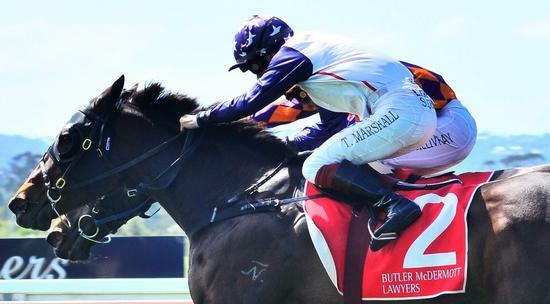 6 wins-1 at 2-from 1100m to 1600m, A$733,500, AJC Epsom H., Gr.1, GCTC Goldmarket H., L, BRC Trilby Misso 2YO H., Sun Disk Systems H., Concept Window Fashions H., Salt Design H., 2d Rockhampton JC Magic Millions 2YO Trophy, BRC Play Gather Compete Belong 2YO H., BTC Mitty's 2YO H., 3d AJC Randwick Guineas, Gr.1, STC Hobartville S., Gr.2, AJC Bill Ritchie H., Gr.3, GCTC Magic Millions Cup. Sire. Sire of 193 rnrs, 127 wnrs, inc. SW Le Capitaine - Seasons Bloom (H.K. ), etc. Covert Charmour (g. by Show a Heart). 9 wins to 1200m, A$137,175, BRC Winning Edge Presentations H., 2d BRC Coke Zero H., SITA Australia 2YO P., 3d BRC Canadian Club H., Hidden Dragon at Lyndhurst H.
Seductive Dream (f. by Captain Sonador). 5 wins. See below. Rock Temple (g. by Fastnet Rock). 2 wins at 1200m, 1400m, A$108,520, ATC TAB Early Quaddie P., 2d ATC Drummond Golf P., Get Racy H., NSW Racehorse Owners Association H., NSW Tatt's RC TAB Rewards H., 3d ATC Hyland Race Colours H., TAB Early Quaddie H., Drummond Golf H., McGrath Estate Agents H.
Kong Kristian (g. by Elvstroem). Winner at 1700m in Aust. Gamely (g. by Golden Archer). Placed to 2019 in Singapore. Lincoln Road (Swiss Ace). 6 wins at 1000m, 1100m, NZ$700, S$414,908, Singapore TC Kranji A S., Initiation P., Windsor Castle S., Class 4 H.-twice, Benchmark 67 H., 2d Singapore TC Garden City Trophy, L, Korea Racing Authority Trophy, Kranji A S., Benchmark 97 H., 3d Singapore TC Kranji A S., Royal Turf Club of Thailand Trophy. Giddyup Kirky. 3 wins from 1750m to 1800m, 2d MRC Le Pine Funerals H.
Cosmic Demon. 3 wins at 1000m, 3d MVRC Adapt Australia P.
Truly Discreet (Teofilo). 4 wins from 1200m to 1600m, A$301,775, to 2018-19, MRC Ladbrokes Info Hub H., MVRC Odds Boost Exotics H., 3d Bendigo Guineas, L, VRC Living Legend Rogan Josh H.
GILDED ANGEL (Made of Gold). Winner. See above. MAYBE DISCREET (Shamardal). 5 wins-1 at 2-from 1200m to 2000m, A$605,700, SAJC Schweppes Oaks, Gr.1, VRC Edward Manifold S., Gr.2, SAJC Morphettville Guineas, L, City of Adelaide H., L, Spring Racing at Morphettville 2YO H., 2d SAJC Schweppervescence S., Gr.3, Jansz H., Holdfast Business Insurance H., 3d SAJC WH Wylie H., L. Producer. 5 wins at 1200m, A$158,850, to 2018-19, SCTC Kirralee Barnard H., 2d BRC Rod Kemp H., CJA International Division H., Trackside Openair Cinema P., SCTC Pump House P., 3d BRC Jim Beam Black H.